The Secret Origins of Wonder Woman. Noted Psychologist Revealed as Author of Best-Selling ‘Wonder Woman,’” read the astonishing headline. In the summer of 1942, a press release from the New York offices of All-American Comics turned up at newspapers, magazines and radio stations all over the United States. The identity of Wonder Woman’s creator had been “at first kept secret,” it said, but the time had come to make a shocking announcement: “the author of ‘Wonder Woman’ is Dr. William Moulton Marston, internationally famous psychologist.” The truth about Wonder Woman had come out at last. Aside from Superman and Batman, no other comic-book character has lasted as long. Generations of girls have carried their sandwiches to school in Wonder Woman lunchboxes. Like every other superhero, Wonder Woman has a secret identity. Unlike every other superhero, she also has a secret history. In one episode, a newspaper editor named Brown, desperate to discover Wonder Woman’s past, assigns a team of reporters to chase her down; she easily escapes them. Brown, gone half mad, is committed to a hospital. But Wonder Woman’s secret history isn’t written on parchment. Instead, it lies buried in boxes and cabinets and drawers, in thousands of documents, housed in libraries, archives and collections spread all over the United States, including the private papers of creator Marston—papers that, before I saw them, had never before been seen by anyone outside of Marston’s family. The veil that has shrouded Wonder Woman’s past for seven decades hides beneath it a crucial story about comic books and superheroes and censorship and feminism. 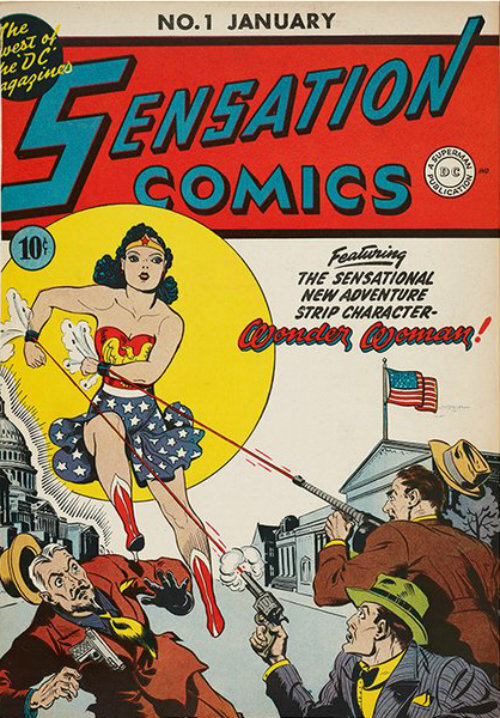 Read on via The Surprising Origin Story of Wonder Woman | Arts & Culture | Smithsonian. This entry was posted in PRINT, WORDS & BOOKS and tagged nostalgia. Bookmark the permalink. ← Capturing the Unbridled Power of a Supercell Storm.